ESF is one of the most prevalent systems in Danish pig production. Several tests have therefore been made to identify the best way to use the system. You can either have the sows in constant or dynamic groups. Constant groups are typically formed by one weekly team once and for all. This way, the dominance hierarchy fights will only happen once in the sows' gestation period. Dynamic groups are formed on a continual basis, where new sows are introduced with fixed intervals. SKIOLD continues to develop the ESF management strategies in cooperation with The Danish Knowledge Centre for Pigs (VSP). The key to success with ESF in the gestation areas is to establish good practice conditions for the young female pigs before they are placed in the gestation area. You might also be interested in our dry feeding solutions and our liquid feeding solutions. SKIOLD has designed and developed an electronic feed station which makes a difference for feed efficiency, animal welfare and ease of use. There are no sharp edges and corners inside the feed station. 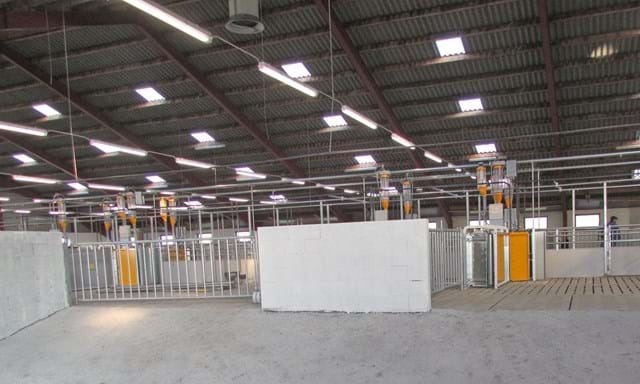 This means that the sows can move easily through the stations without risking injuries. At the same time, the trough has been designed to match the natural eating behaviour of the sows. The feed station is built of sturdy steel plates to ensure longevity. It has air-controlled access gates and air-controlled access to the trough. In the new generation there is extra focus on animal welfare and user friendliness. A built-in cleaning system automatically rinses the trough after each feeding. This prevents accumulation of old feed and ensures that the system provides fresh feed for each sow every time. 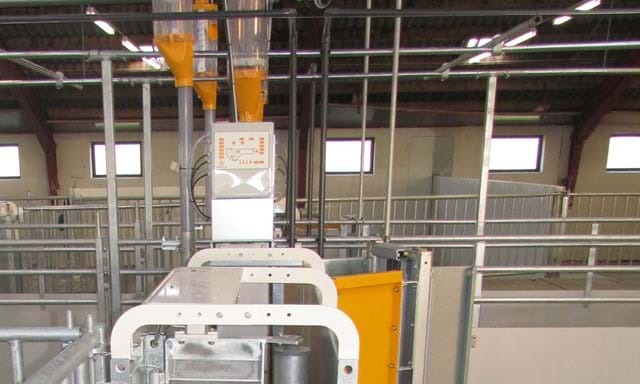 The rinse system is an innovation and has not been marketed in feed stations before. Manual rinsing is also possible. If you do not have a separation pen, or if you wish to mark certain sows for vaccination, etc., a colour spray system is available for installation above the eating area. The spray system can operate with up to three different colours. 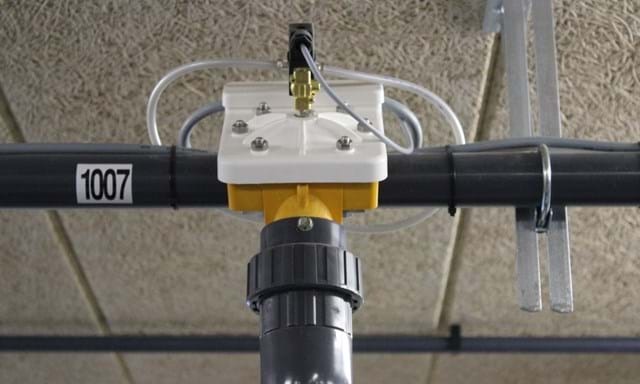 With a SKIOLD transponder system, you decide whether to have dry feed or liquid feed in your ESF stations. It is possible to use up to two recipies in dry feed and this allows for differentiated feed distribution and changing of recipies at a time that suits you best. There are a number of possibilities for tailored feed curves, which ensures flexibility in your everyday life. The ESF computer is a robust, industrial computer made in Denmark that can withstand the rough conditions in the housings, which are often not insulated. The computer features all facilities to be expected for a modern feeding computer. Various Windows based programs for remote control and management are available. With the hand-held terminal, you can take all the data for your sows with you wherever you go. A newly developed wireless scanner makes it possible to read the sows' ear tags, providing you with instant access to all relevant data. The hand-held terminal features a plug connection, which can be used for recharging the terminal or transferring new data to both the feeding computer and the management program in your PC. The combination of newly developed hardware and software constitutes the perfect tool for administration of ESF as well as liquid feeding.